This list of the best tablets in Walmart has been designed to make your life easier if you're shopping for a new device and aren't sure which option is right for you. Walmart has a great selection of brilliant tablets, from Apple iPads to tablets running Android or Windows 10 – and they regularly have good deals on them, too. In fact, with hundreds of Black Friday Walmart deals just around the corner, we're expecting to see some brilliant tablets for sale at Walmart over Black Friday 2018. We've scoured the retailer's website to find the best prices on the top tablets at Walmart, and our smart price comparison tool will make sure that you get the best deal possible. 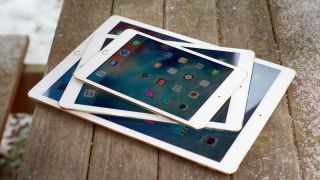 This year's iPad tablet from Apple is our pick of the best overall tablet you can buy from Walmart. This is a tablet that does everything well, with a good screen quality, excellent camera and great performance for the price. Speaking of price, it's not that expensive compared to other Apple products, and the 2018 version also supports the Apple Pencil stylus (which you'll need to buy separately). You can choose between 32GB and 128GB capacities, and the 9.7-inch display is bright, vibrant and crisp. The Samsung Galaxy Tab S3 is another all-round excellent tablet that can handle almost any task. It comes with a beautiful HDR (high dynamic range) 9.7-inch screen, which makes media and images really stand out. Battery life is good, it has a fantastic camera and you can expand the 32GB storage space to 400GB with a microSD memory card. This is a tablet that can be pricey, but Walmart has some excellent deals that will help you get this tablet for a competitive price. Apple's iPad Pro is the best high-end tablet Walmart offers. It expands on everything we love about the regular iPad, packing in more powerful hardware and an improved screen to make it a brilliant tablet for productivity. The new ProMotion screen is a particular highlight. It features a refresh rate of 120Hz - twice the rate of standard tablet screens – which makes games and media look amazing. It also means the iPad Pro feels fast and responsive, especially if you're drawing with the Apple Pencil stylus. If you don't mind going for a slightly older tablet, then the Samsung Galaxy Tab S2 offers brilliant value for money, making it our pick for the best cheap tablet at Walmart. It comes with some excellent features, such as 32GB internal storage and support for microSD cards up to 128GB for even more space to keep apps and files. It also has a fantastic 2,048 x 1,536 Super AMOLED display and enough powerful innards to keep this tablet running quickly and smoothly despite its age and price. If you're looking for a smaller tablet from Walmart that's a bit easier to carry around and hold than some of the larger slates, then the iPad mini 4 is well worth your consideration. It comes in a shrunk down-design that, as you'd expect from Apple, looks fantastic, and the latest version comes with a screen upgrade and more powerful components. Walmart offers some great deals on this diminutive tablet, so if you're on the lookout for a 7-inch slate, this is the one to get. Walmart offers a great selection of Android and Apple tablets, and it also stocks some brilliant Windows tablets as well. These tablets run Windows 10 – an operating system that works very well on tablet devices – and allow you to run regular programs such as Photoshop, rather than lumbering you with apps. The Surface Pro is the best Windows tablet Walmart currently sells, and as you'd expect, it comes with some brilliantly powerful components and excellent features, and a price tag to match. Acer makes some brilliant tablets, and the best one you can buy at Walmart is the Acer Switch 5. This is another Windows tablet, and it's a great alternative to the Surface Pro above. It can be used as both a tablet and a laptop-like device, making it a great little productivity device for students and professionals. The display is good (though not quite as good as the Surface Pro's), and it's a dab hand at drawing as well if you use a stylus. This unique tablet comes with a projector built into it. The Lenovo Yoga Tab 3 Pro also features a fantastic 10.1-inch screen, which makes it a large tablet that's great for media and productivity, and its sound quality is great as well. Thanks to the integrated projector, this is a fantastic tablet for presentations, and it's our pick for the best Lenovo tablet that Walmart currently offers.